The hundredth anniversary of the Titanic’s sinking is nearly here, making me wish for fiction about it that doesn’t involve Jack or Rose. PD Singer has provided that with Maroon: Donal agus Jimmy, a novella length story that follows men who built and sailed her rather than the glamorous passengers and officers. Working men love and dream too. Donal, the problem solver, flies into action once he’s found, or been shown, what needs to be fixed -- he’ll solve his family’s financial crisis, even at the cost of sorely needed privacy. What seems like a sacrifice at first, and then the torment of closeness that can never become more, turns into the great joy of Jimmy. Donal’s never had a lover before, and when Jimmy makes it possible to express their interest, we are treated to a sweet, tender love story. The two of them must invent everything as if it’s new just for them, and keep it all hidden, because the world isn’t ready to be happy for them. Jimmy, the visionary, sees what could be, both good and evil, and acts to make one happen or mitigate the other. He must see enough small clues to risk finding a way to let Donal know of his interest, and oh, how good life becomes for them. But he also sees the evil that will come from the growing muttering for Home Rule, and how it could touch him and his Donal. 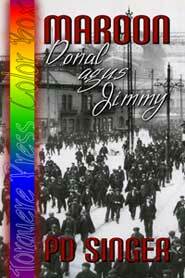 His job in the boiler works makes him a likely candidate for passing along contraband, which Jimmy sees as a real possibility. “If they offer threat to you….I will do anything they want.” A good man and non-partisan, he looks for, and finds, a way out. This is 1912, and the Pride of Belfast, which they’ve helped to build, is the next ship Jimmy can sail in to see what lies for them in “Amerikay”, and that ship’s other name is the Titanic. Though we can see it coming, the author slides that in so delicately that the reveal comes as a heart-wrench. Jimmy’s worked so hard to get aboard that ship, and they don’t know. I knew it was coming and I still cried. The period detail is woven seamlessly into life in early twentieth century Belfast, with gas lights and newly electrified trams, a pint at the pub and a job at the shipyard. With men who want to change their world, and our couple, who doesn’t want to be crushed under the change.